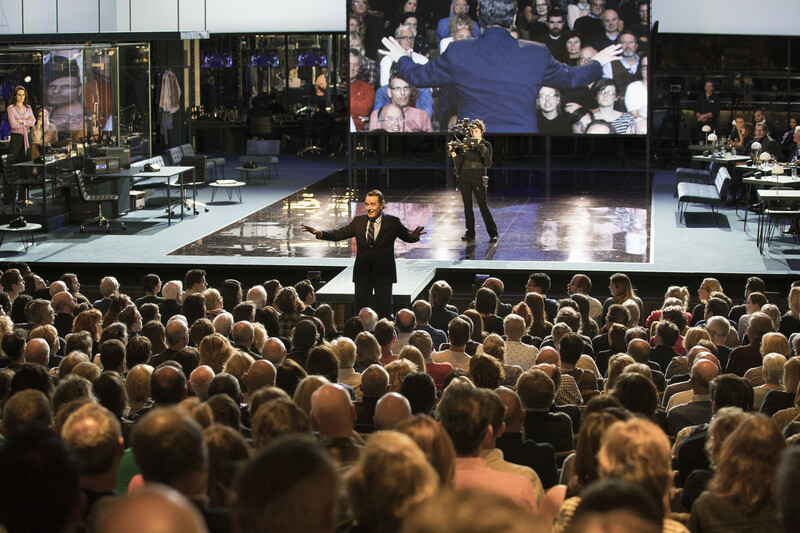 You’ve only to cast your eyes down the cast pages of the NT’s heavyweight theatre programme to see the scale of those involved in Ivo van Hove’s production of Network. Van Hove, today’s director of choice, does love to adapt films for stage viz recent visits to the Barbican with a controversial trio of Visconti and Bergman films (Obession and After the Rehearsal/Persona). Network sees him taking the NT’s Lyttelton stage to another technical dimension. Adapted by Lee Hall from Paddy Chayefsky and Sidney Lumet’s 1976 film, van Hove has created a super-realistic tv studio complete with super-sized screen, floor managers and video cam closing in to provide a gallery of instant close-ups. Not content with that, as with his breakthrough production in the UK of the modern-dress Roman plays, van Hove increases the heightened realism by at one point taking the cameras outside as Douglas Henshall’s middle-aged tv producer, Max Schumacher and Michelle Dockery’s ambitious, up-and-coming successor, Diana Christensen discuss their possible emotional involvement, in actuality, outside the NT’s Southbank building. Throughout the production, too, as with the Roman plays, van Hove invites audiences to join the actors on-stage as they wine and dine with menus specially prepared by the NT’s catering staff. Immersion in the life and production of tv News is therefore almost total as befits a drama, styled as a `satire’ on the media, how News is presented and its transition into `entertainment’ with the rise of the cult of personality/celebrity. Whoever decided to revive Chayefsky’s film via a stage production made an astute choice. Network could hardly be more topical or timely at a time and in an era that has become infamous for false truths, `fake news’ and where ideas have become truncated and traduced by social media. Network, the film, was originally shown at the height of the Nixon Watergate scandal. Then – as now – the media was instrumental in not only reporting news but in creating it. Then as now, News channels were becoming ruled by ratings and began their transformation into `shows’ and `entertainment’. Lee Hall’s adaptation makes no bones about its parallels with now and denunciation of the soporific, manipulative power and influence it exerts over society – even extending the climax to show successive USA Presidents taking the oath of office, starting with Nixon, through Gerald Ford, on into the Bushes, Clinton, Obama – shouts of hooray ring out – and Trump when the NT audience sets to with a braying sound of boos and catcalls. Beale, on the point of being sacked because of falling ratings is saved when he declares on air that he is going to commit suicide, so fed up is he with `telling lies’ to the public. Overnight he becomes a sensation and re-employed to continue in similar vein, to express the public anger Christensen feels Beale has tapped into – much in the same way, with similar popular appeal, as achieved by Trump and the Boris/Gove/Farage Brexiteers. Described as a `satire’, Chayefsky’s critique lies more in the overall idea of networks’ hunger for ever more dramatic news than any satirical dialogue as such. Henshall plays it very straight as Max Schumacher, the producer who although smitten by Christensen is essentially `a decent guy’. Dockery plays Christensen with a swashbuckling sexuality, even to agreeing to a gratuitous coupling with Schumacher not just in full view of the video-cam and therefore magnified on screen, but seated at one of the tables in the midst of diners on stage. Who says actors don’t suffer for their art? Elsewhere, there are telling and striking performances from comparative newcomer Tunji Kasim as a network controller, Frank Hackett and from former RSC dependable, Richard Cordery as Jensen, the head of the network, about to be taken over by another in hoc to the Saudis (even then, forty years ago, Chayefsky clearly saw the way the Middle East petrol dollar was ruling the roost; or is that a Lee Hall add-on?). 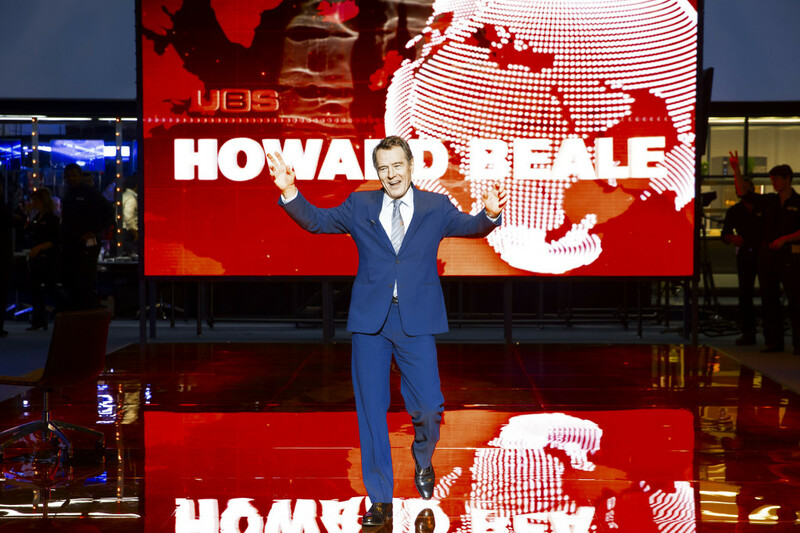 In the end, though Beale himself is killed, the moral of the story returns to the age-old endorsement and saviour, of commitment to each other, and to other people, sensitively conveyed by `Breaking Bad’s’ Bryan Cranston who rides Beale’s ambivalence between cynicism and despair with a fine edge and knock-out assurance. Even if the medium in this case is somewhat overstated by van Hove, there is no doubting the urgency and the importance of the message. `The medium is the message’, asserted Marshal McLuhan more than half a century ago. But the message is utterly worth re-affirming in these troubled times. The cult of personality, writ large, hooray for Paddy Chayefsky. Produced in association with Patrick Myles, David Luff, Ros Povey and Lee Menzies. Presented in association with Dean Stolber. Production supported by Maria Grand in memory of Richard Grand and by Kors Le Pere Theatricals LLC. 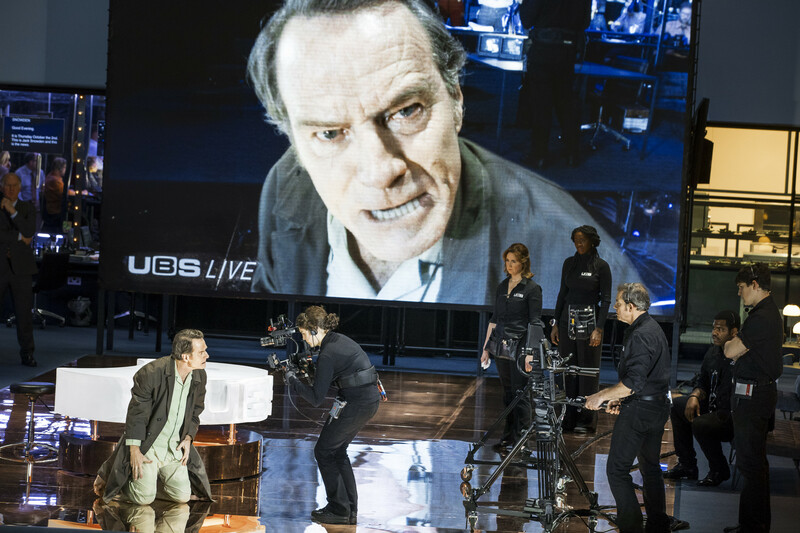 This entry was posted in 2017, Reviews and tagged Bryan Cranston, Douglas Henshall, Ivo van Hove, Jan Versweyveld, Lee Hall, Lyttelton Theatre, mass manipulation, media and politics, Michelle Dockery, National Theatre, Paddy Chayefsky, Richard Cordery, toxic crossovers, Tunji Kasim on November 16, 2017 by Carole Woddis.